HELP WANTED: Physicians and RNs. We can use a little help. We like each session to have at least three practitioners and three RNs. We ask that you volunteer with us once monthly. You can be retired, of course, but you need to have a current practicing license. Think about it…please. Saturday mornings, 9:00 A.M. to noon: 10/14, 10/28, 11/11, 12/16. Thursday evenings 6:00–8:30 P.M.: 10/19, 11/2, 11/16, 11/30, 12/7, 12/21. If you have any questions, please call me at 248-677-2273, ext. 23 or e-mail our Head Nurse, Diane Dengate, at dengate436@aol.com. HUDA Clinic, 13420 Woodrow Wilson, Detroit, MI 48213, 313-444-5490. A sliding fee scale clinic is Covenant Care Clinic, 27776 Woodward, Royal Oak, MI, 248-556-4900, across the street from the Westborn Market. It is a full-service clinic and open 40 hours a week. They also take Healthy Michigan and Medicaid insured patients as well as other insurances. They also have dental services at their clinic on Detroit’s East Side. ROBERTSON BROTHERS IS A FAMILY-OWNED COMPANY IN BUSINESS for over 70 years, providing housing mainly in Oakland and Wayne Counties. Some notable projects include Lexington on the Park, Sherman Oaks and Normandy Oaks in Royal Oak. Taft will consist of 72 one-to-two car garage townhomes ranging from 1200 to 1500 square feet. Two or three-bedroom options will be avail-able, and homeowners will be able to select their finishes within 30 days of purchasing their new home. All finishes will be available at the Robert-son Brothers design center located at their main office building in Bloomfield Hills. Because of the new concept at Taft the approvals took a bit longer than expected, but the project is only slightly behind Wilson’s schedule. Demolition is scheduled for mid-October, which will be followed by grading and installing the underground utilities. “Unfortunately, paving won’t likely happen until next year,” Loughrin said. The asphalt plants will close down in late Fall, reopening sometime in April or May. He is hopeful they will be able to complete a model in the meantime, however. Subcontractors have placed bids on both projects, and Robertson’s project managers are busy overseeing work. According to Loughrin, the community was heavily involved in the planning phase as the company engaged in neighborhood meetings to ensure they were offering new home options needed in the Ferndale area. “The community is aware of what we’re doing.” Loughrin said. Justin Lyons, Planner at the City of Ferndale, said, “These will be a big benefit to schools. The sites were a bit of a burden to the community, with the buildings deteriorating. The development partner came up with a plan to alleviate this burden.” He adds that the new sites were “part of a master plan adopted earlier this year regarding the major theme and goals, including providing more types of housing and housing options.” Through a public participation process, the City tried to determine what residents want, and new stock was an issue that came up time and again. “This’ll be a great option for families or anyone who is looking to move to Ferndale,” he said. NOT EVERYONE IS SO ENTHUSED. David Lungu of The Ferndale Historical Society went to Wilson Elementary as a child. He lived one block from the school for a number of years. “I am 52, and have been a resident of Ferndale almost all my life,” he said, having moved to Southfield just a few years ago. He has been a board member of the Historical Society for 25 years. As far as the new housing project, David said, “I am really not in favor…because we will lose valuable green space. I remember watching commission meetings where they said they will not get rid of green space. I guess times change,” he sighed. 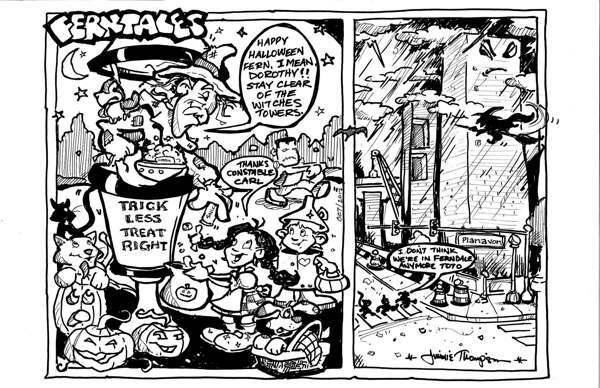 “I do think if they had just replaced the existing footprint of the school with new housing and kept the rest green it would be okay, since buildings were already there.” Ferndale will always be special to David. “My favorite thing about Ferndale is the friendly and nice atmosphere. I felt real safe and still do when I visit now. For over 45 years I lived in Ferndale, went to Wilson school, then to the old Coolidge Jr. High, then to Ferndale High School where I graduated in 1983.” He recalled many fond memories of attending Wilson Elementary School and baseball games at Wilson Park. SO, THERE HAS BEEN A MIXED REACTION to the two builds, consisting of either enthusiasm or a sort of nostalgic regret. The area is losing a couple of valuable historic monuments, but the new housing will no doubt attract new residents and boost commerce. TO MAKE CHANGE, YOU DON’T ALWAYS HAVE TO SEE IMMEDIATE RESULTS. Sometimes it’s opening peoples’ eyes and minds to a thought, an idea. That is what one local Ferndale resident did when she went for a walk one day in late August near the Wilson Park. 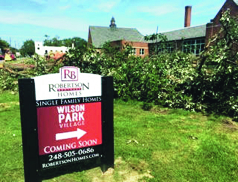 As construction at the site of the former Taft School began (see adjoining article), Shannon O’Brien, a resident of Ferndale for about 25 years and Ferndale Friends Circulation Manager, noticed trees that were marked to be cut down. Already feeling a little disheartened, she remembered taking her son when he was younger to the park, and how he would sit under the trees for shade. While the city landscape has changed, O’Brien said cutting down these old trees which have stood for more than 100 years, and a philosophy of developing every inch of space, is not characteristic of the Ferndale she loves. O’BRIEN WENT HOME WANTING TO DO SOMETHING to try and save the trees. Then she had an idea: She looked around for something to write on but all she could find was a brown paper bag. She made a quick sign that simply read, “SAVE ME! I am 150+ years old. I cannot be replaced. Please think about my bottom line, not just yours.” Then she marched down to the park and hung it on one of the trees. Not thinking her brown paper bag sign would have much of an impact, she was surprised to find that within several days signatures started to show up on her sign, which stayed tied to the tree on the south side of the former campus. Before she knew it, there were more than 50 signatures on her sign, and the brown square with her words printed on it stayed until it was one of the last few trees standing. While the trees were not spared, O’Brien’s spirits were lifted not only by the people who signed her statement, but also stepped up to try to save other trees throughout the city of Ferndale as others began posting similar signs. And her tiny campaign sparked a minor fury around town on social media, and led to articles in Oakland County Times and an interview with Channel 7 WXYZ News. When she went to where the tree once stood, after work as a caregiver, the tree was now only a stump. O’Brien went and counted the rings. 127 in total. O’Brien does not know what will happen next, but her love for trees and finding a balance between development and preserving the rich and old natural habitat of the city will continue to be on her mind. 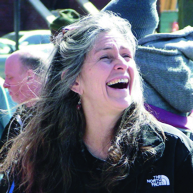 She has reach-ed out to the developer and city officials, and if she can find others to help her she may start reaching out more in a grassroots effort. While development, growth and progression will most likely continue in our city and others, O’Brien is becoming more hopeful that developers and City officials will be more conscious of the area’s natural habitat. “My son said to me, ‘Do one thing different, and it will make a change,’” O’Brien said. “One small thing can make a difference: ask questions, ask for support or join an organization. I want to bring more consciousness and am thinking of reaching out to different organizations like the Historical Society to see if there is interest (in preserving nature in the city. O’Brien is not discouraged by the trees at the park being cut down. The community’s input, signatures and surprising kindness has given her hope for Ferndale, and the surrounding area’s natural beauty and heritage. “One of my friends said she loves what I am doing, and how I am doing it in a peaceful way,” O’Brien said. Originally from Southwestern Michigan near Kalamazoo, he relocated to Detroit in 1999. “At the time, I didn’t know anyone here,” he said. “But it was the best decision I ever made.” His areas of expertise include community and economic development at the state level with the Michigan Economic Development Corporation, and strong financial management as a Senior Financial Credit Analyst in the banking industry, as well as positions within local, county, and state levels of government. Prior to accepting the position of Oak Park City Manager in 2012, he held the same role in Hamtramck. 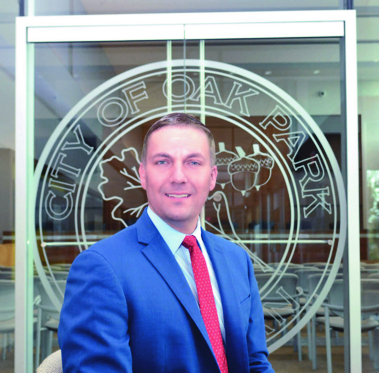 Not only is Tungate invested in Oak Park, but he holds high hopes for the Detroit region, “Having the cross-state familiarity that I do, and with the economic climate that we now face, it’s what motivates me and makes me want to get the entire state of Michigan running on all cylinders. There’s a formula we have to find to bring our unique interests together for the welfare of all of us. Unfortunately, right now there’s too much division.” Working with other communities on projects or to make change promotes the regionalism in the area and allows the entire region to prosper. With this in mind, new restaurant owners are able to secure a liquor license in the once-dry city. This new economic development tool that enables new restaurants to secure a Class “C” liquor license for under $2,000 helped us to attract a new destination restaurant, “8MK.” “8MK” is a restaurant currently under development by the Union Joints Restaurant Group which also owns The Clarkston Union, Union General, Union Woodshop, Woodshop Shop, Vinsetta Garage, Fenton Fire Hall, Pumphouse and Honcho. “When the opportunity for 8MK came to us, we pounced on it for two reasons – we were able to preserve a historic building, and it helped open us up to 8 Mile Rd.” 8MK occupies space once held by the WWJ transmitter building and 8MK is a reference to the station’s original call letters. Tungate is focused on maintaining the city’s diversity. “Oak Park is the eighth-most diverse city in Michigan, and it is a perfect example of a diverse community that gets along and works together. What I would like to see is us continuing to attract new residents who appreciate what we have to offer. OUR WORLD IS RETRACING roots and rediscovering a passion for trades our parents, and grandparents spent lifetimes mastering. Simultaneously, society is relearning to see an individual for the goodness in their heart, joy in their dreams, and the consistency of their contributions. We all have a purpose, but we must travel a personal journey dictated by our choices and commitments to discover the substance with which we will fill our souls. Rachel Oliver navigated her journey with the help of the skills and life lessons she learned in her father’s shadow. In each of his children he instilled the understanding that gender was not an excuse or limitation on one’s ability to persevere. 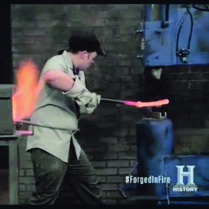 Raised between Taylor and Carleton, Michigan, Oliver was recently launched into the limelight with a once- in-a-lifetime opportunity to be a participant on History Channel’s fourth season of ‘Forged in Fire.’ Critiqued by world-renowned bladesmiths, she competed against expert bladesmiths and blacksmiths, filming for 10-15 hours day on set where she won second place. The day starts before the day on set. It starts with a ride through New York City, en route to the Brooklyn forge. Taking it all in was surreal, from cars driving in reverse on one-ways to peddlers on street corners selling food and wares. Once you arrive at the set, you are in for a long, long haul, consisting of 12- to 15-hour days, and several interviews. There is lots of downtime, which is the coolest part. This is where you get to mingle with the competitors and talk shop, trade secrets, methods and history of many things. The judges are all there, the host is there, and they all come chat. We didn’t forge until late after-noon. We came into the forge for the first time, it’s secretive until we enter the floor. We are not privy to any of the layout until it’s time to compete. When you walk into the forge, it’s like entering battle-grounds, a coliseum if you will. When the host says “go,” it’s hammer time and that clock does not stop for anything. Bathroom breaks? Nope [laughter]. Luckily, floor hands take care of our hydration needs. Hydration is the word you hear more on set than anything else. We get so amped up we forget about our own well-being. The entire time you’re on the floor there are upwards of 50 people, the judges included, all over the place. You have camera guys following you around, big Hollywood lights, an OSHA guy is on set, I mean it’s a huge operation. What are some key takeaways and moments you will never forget? I was given the chance to work in an arena that blacksmiths I revere have also competed in. I got to work with three great guys: a youth minister, a blacksmith who’s been at it 28 years, and a blade smith with skills that blow my mind. The blade smith, Shawn, was kind enough to sip scotch with me after hours drawing up diagrams of how to make things easier, how he does things his own unique way. One of the best memories though was the cannon-ball run trips through New York City, racing to the studio every morning at speeds none of us expected. Our handler could drive like a pro. How did you get selected for the show? I was emailed by them, on a page I sell my wares. All in all, it was about an eight-month process from first email to air date. Talk about the role your father played influencing your passion and work? My dad is one of the most gifted, intelligent, creative multi-disciplined tradesman I have ever met. I was his shadow from the time I could walk, always following him around, asking him any questions I could to know more. He was never one to allow my three sisters or I to use “being female” as an excuse to not persevere. He raised warriors, not princesses, and we all have grown into badass, tough-as-nails women. For this, I couldn’t be more grateful. What do you enjoy most about your art/craft? My niché in bladesmithing is in the vein of repurposing and upcycling quality materials. To take something that served a noble purpose that has gone dull, broken, worn out, and to breathe new life into it with a new job and ability. I feel this is keeping our blue-collar roots alive. Many of the files and rasps I repurpose are a hundred or more years old. I even came across some files made right in Detroit, dating back to 1870! One of these will find its way back to its city of birth for a Corktown sous chef. To me, this is beauty, this is art, this is keeping our history alive. 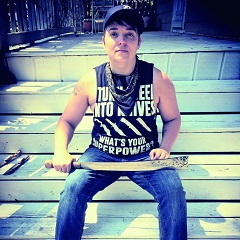 What are the most challenging and rewarding facets of being a genderqueer lesbian in your field? The next step? The next step is hoping for a redemption episode, one more crack at the Brooklyn forge. Until then, it’s hammer down. Expanding my knowledge, abilities, honing my craft, networking more and hoping to pitch an idea for a TV series, blade-related of course [laughing]. Northern TV & Vacuum : A Rare Gem for Reliable Electronic Repairs since the ‘40s! His strong work ethic, outgoing nature and enthusiasm for repairs has remained strong, and his store continues to thrive. His educational back-ground in applied science and electronics enables him to understand the complex nature of repairs. With seven specialized workstations set up in the store and a highly trained staff, Sheppard ensures that he keeps up with ever-changing technological advances and evolving customer needs. The store has a vibrant history. It was founded in 1940 by Clay Walker, who worked in the 1930s for Jamison (Jam) Handy, a motion picture company in Detroit. Walker predicted that television was going to be much bigger than radio, which turned out to be accurate. The first Northern TV store was located in Detroit, and a second store opened shortly afterwards in Royal Oak. At the time, bar owners were the main clientele, purchasing TVs for their popular bar room daily broadcasts. Despite the fact that during World War II all commercial production of television equipment was banned and TV broadcasting was limited, Clay opened a third store in Port Huron. He anticipated the big surge in TV sales post-wartime, which did occur (and is still occurring). Clay eventually bought out his two partners, and kept open only the Royal Oak location. In 1962, the lucrative company was sold to Ray Olson, Joe Boginski and Archie Bartley, and it continued to prosper and grow. Meanwhile, Sheppard had set up his own service stores at the young age of 24: Sheppard Electronics, with locations in Troy and Warren. Unafraid of hard work, he supplemented his income in the early years with other jobs, including teaching both college and high-school level courses. “I still have the first dollar I ever made!” Sheppard told me with a smile. In the late ‘80s, Sheppard began repairing camcorders and VCRs at Northern TV. By the early ‘90’s, Olson, Boginski and Bartley were preparing to retire, and on October 1, 1993 Sheppard bought the business. Between ’94 and ’95 he closed his other stores, and gathered everything under one roof. Then in 2012, the store moved to its present location in Madison Heights, starting year number 72 of business. Northern TV is diverse. The staff can fix almost any electronic device, antique or newer, including any TV, radio, turntable, vacuum cleaner, etc. An impressive ar-ray of accessories are always kept in stock. In addition, other services are available, such as audio and video transfers from older media types (all formats) to modern digital storage. Reel-to-reel conversions are also in big demand, as the tape softens and deteriorates. One popular service offered is the installation of a Blue-tooth system into vintage stereos or radios, turning it into a sort of soundbar speaker. Sheppard further ex-plained, “Even a cheap, antique model will outperform a regular soundbar!” Customers with some knowledge of electronics can also buy a kit and install it themselves. Sheppard gives back to the community by staying involved with the Madison Heights DDA board. Additionally he plans on starting a program with schools in Madison Heights using radio kits. He aims to “create a spark and re-establish a connection” in younger age groups, as the skilled trades industry in general is having problems retaining young people. I asked Sheppard for a most memorable customer moment. 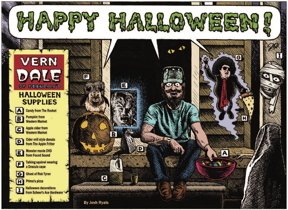 He immediately recalled the time where he was visited by Bobby Jr., the son of composer Robert Bateman, who helped write the hit song, “Please Mr. Post-man.” As it happened, the sound engineer who had worked on the hit (Ed Wolfram) was working in the store that day. Then in walked Lee Allen, a legendary broad-caster from the ‘50s and ‘60s, who had been the first DJ to play Bateman’s hit song on air. Naturally, all three had plenty to talk about, and Sheppard described it as a magical moment. Certainly, Sheppard and his staff have created a business with great ambience and where customer satisfaction is the priority. Many more magical moments will no doubt follow! Northern TV and Vacuum is located at: 27633 John R Rd in Madison Heights in the Farnum Plaza; 248.545.1800, or check out their website: www.northerntv.net. M-F, 9am-6pm; Sat, 9am-Noon; Sun, Closed. The tower is up! And Ferndale is about to start tuning into our very own community radio station:100.7 FCR FM. The station is on the air now, with a couple of two-hour recorded loops. The station is expect-ed to go live in the weeks ahead with a full programming schedule by late November. Currently, they are building out the studio, painting, and preparing to install the final audio gear. FCR is a 100-watt LPFM (short for Low Power Frequency Modulation) station, with a projected broadcast range of two miles in any direction. The FCR signal is strong and static-free all over Ferndale. LPFM stations are required to make sure their signal does not interfere with existing, mega-watt commercial stations, including one on the same frequency in Canada. They are looking to fill DJ and other station positions. Interested volunteers should contact ferndaleradio@gmail.com. To contribute to Ferndale Community Radio, go to: www.chuffed.org/project/ferndale-radio Sponsors are also needed, contact ferndaleradio@gmail.com.